Pope Francis surprises patients and medical assistants with an unannounced visit to St Peter’s Square’s First Aid Station ahead of the Second World Day for the poor. Pope Francis visited St Peter’s Square on Friday 16th of November where, upon his request, a First Aid Station has been installed. This initiative, supported by the Pontifical Council for promoting New Evangelisation, aims to offer medical attention to those most in Just two days ahead of the Second World Day of the Poor, celebrated on Sunday 18th November, Pope Francis took the surprise visit as an opportunity to chat to medical assistants and patients, even joking with a group of people whilst they waited to receive medical attention. 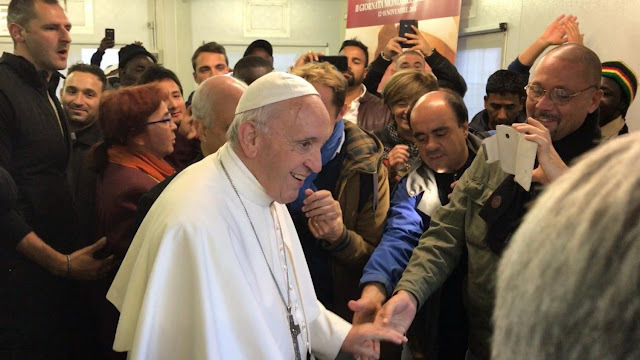 Pope Francis brought attention to the Second World Day of the Poor after Sunday’s Angelus, expressing his hope that this day “will encourage greater attention to the needs of the least and the marginalized”.